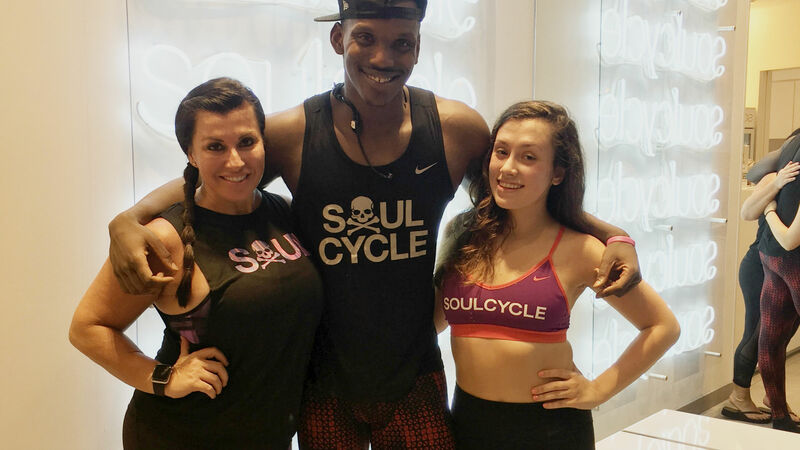 Dana: I first heard about SoulCycle through a friend who had taken a class while on vacation in the Hamptons. Knowing that my husband and I would soon be empty nesters, it was important for me to be my own person and find something for me to enjoy on my own, and I found that in SoulCycle. I loved it so much that I asked my daughter, Danielle, to join me for a ride. She finally agreed in January 2016 – halfway through her senior year of high school. Danielle: It took Mom awhile to convince me, since I was nervous about how well I would do. But once I got through my first class, the sense of accomplishment and the fun that I had doing something together with her had me hooked! Dana: We each book our own bikes, though I treat her to her rides and retail! The bond that we have formed is priceless to me. Danielle: At first my mom would book both of our bikes, but I ended up hopping in because it’s hard to get two good bikes by yourself when everyone is vying for the front row! She treats me to rides. Thanks, Mom! Danielle: I was pretty nervous when I first came to ride. I already knew my mom was pretty much a veteran rider by the time I joined up, and I was apprehensive about being able to keep up with the class. My first instructor -- and the instructor I've taken primarily since -- is Wayne Phillips. He was really great and kept the class energized -- and motivated me to keep up! Dana: I absolutely love Wayne Phillips, and I knew Danielle would feel the same way when I took her for her first ride with him. We’re both loyal Wayne riders now and his playlist always appeals to both of us! As he says, he always has something for the "youngins" and the "vintage" riders. We always leave Wayne's classes uplifted. Danielle, which word in the mantra describes your mom and why? Danielle: I think my mom would definitely be a ROCKSTAR! She has such a great energy and is so personable. She is constantly making friends wherever she goes. I swear, she’s more on top of the latest trends then I am! No matter where we go, my mom always has positive vibes, on and off the bike. I’ve gotten to appreciate that even more since we’ve been riding together. Dana, which word in the mantra describes your daughter? Dana: I would describe Danielle as a WARRIOR. She has amazing confidence -- something I wish I had more of. I really admire that about her. Do you ride differently when you're together? Danielle: The fact that my mom and I get to go to classes together is what really makes it for me. I don't think going would be the same without her! We really connect when we go, whether it’s giving each other looks during class or talking about how hard some parts were or how good the songs were. My mom is part of what makes SoulCycle so great for me. Dana: Danielle and I always try to ride side-by-side in the front row. We always exchange looks when there is a song played that we love or when our arms are killing us during the weights! How would you describe SoulCycle? Dana: Family. We have met some of the nicest people I have ever encountered. Everyone is always asking Danielle about what school she will be attending, what her major is, etc. I feel like I have developed genuine friendships with the riders and employees of SoulCycle. Danielle: Rewarding. Not only because of the confidence I gained through knowing I'm getting a great workout, but also from the amazing people who frequent SoulCycle and the bonds I've made. Everyone I talk to is always so friendly and inviting, and we all share an energy and connection when we take classes together. The bond I've formed with my mom through going to SoulCycle was probably the most rewarding thing of all. The connection we built over the year is priceless to me. Last Thursday, you two rode together for the last time for a while, as Danielle is off to start her freshman year at the University of South Carolina. What memories will you take with you? Danielle: Taking these classes with her has been one of the most fun and rewarding experiences I've had during my senior year. Dana: I’m tearing up just thinking about her going away to college, but I look forward to her visits home when we can ride together again!